This has been a bit of an action-packed week, so I just wanted to reflect on some recent successes and thank the people who’ve contributed to them. First is that thanks to you guys, we reached our fundraising goal on indiegogo to send An Evening With Satan on tour! On behalf of everyone at Punctuate! Theatre, thank you to everyone who chipped in. For a new, small theatre company, $1000 is a great boon to our performers, and will definitely make life easier this week as they bring the show to the Vancouver Fringe Festival. Second, last weekend’s Shareable Neighbourhood walk on Streetcars had far and away the best turnout so far. It was really inspiring to see so many people with such zeal for learning more about Old Strathcona, especially on a chilly Saturday morning. This time it was led by Earl Grotzki, a local history buff who’s been volunteering with the Edmonton Radial Railway Society for about a decade. You can check out the pictures on the Facebook group. 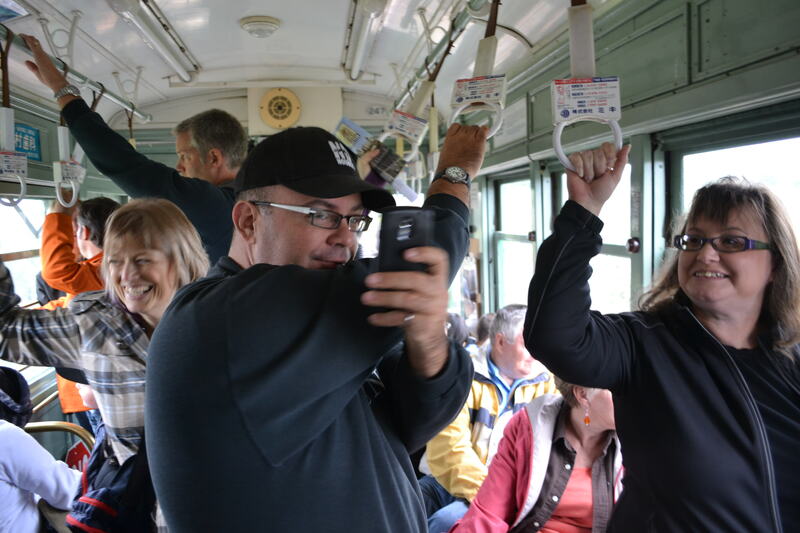 We had some comedians in the crowd for the streetcar ride with last weekend’s Shareable Neighbourhood. Did you know that when the North Saskatchewan River flooded in 1915, they put a train on the Low Level Bridge to keep it from being torn away by the current? I do now. Third, Terra Informa has just been picked up on a new station in BC: Kootenay Co-op Radio on CJLY 93.5 FM in Nelson. Sure, it’s just one more slot on one community radio station, but I take it as a big vote of confidence for the show. Not only is Kootenay Co-op Radio the station that produced the highly listenable Deconstructing Dinner, Terra Informa has gone through some dramatic transitions lately. Relentlessly positive long-time producer Steve Andersen left this summer, as did a bevy of other great interviewers, so Kathryn Lennon, Matt Hirji and I have stepped in to take on some of his work in cultivating new voices for the show. Every week, I go back and listen to stories from the old team to understand how they made thoughtful, engaging radio out of everything from garbage sorting to the worst coal plants in the world. It’s a testament to the hard work of the new contributors like Annie Banks, Morgana Folkmann and Hamdi Assawi that a station like Kootenay Co-op has added us to their lineup. Last but not least, I’ve been scooped up as the Alberta Council for Global Cooperation’s new communications officer. I’ve been a fan of ACGC for many years (and were a fan of mine earlier this year with the Top 30 Under 30 profile). Starting at the office today, I was even more excited to see that they take international development and cooperation as seriously and critically as Trent University does. So from a rich new intellectual environment to the efforts of my colleagues being recognized, this has been a pretty good week. Thanks to everyone who’s made these things possible. < Why didn’t he just ride down 83rd Ave?